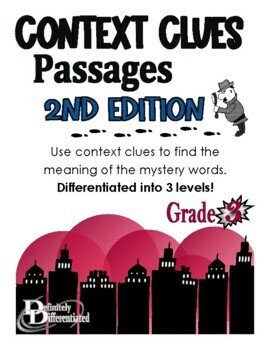 Have fun practicing context clues with our bestselling Mystery Passages! 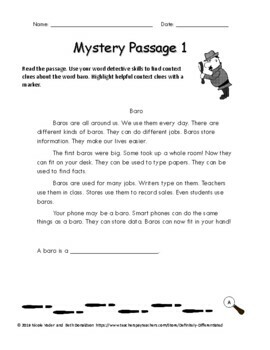 Mystery passages develop context clue skills by asking students to read a passage with a nonsense word and use clues to determine the meaning of the nonsense word. Each passage is differentiated into three levels to meet the needs of all learners. It is the same basic passage with the same nonsense word, but modified into three reading levels. This way, passages can be used as a whole class activity, individual assignment, or guided reading group activity. As students progress, the passages become shorter and contain fewer clues until students can determine the meaning of a mystery word within one sentence. 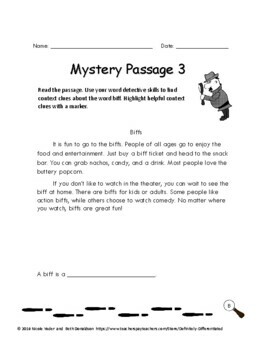 Students will enjoy solving the mystery while learning how to find context clues. Follow us for more highly differentiated materials and fun freebies! Even more DIFFERENTIATED language arts! As such, it is for use in one classroom only. This item is also bound by copyright laws. Redistributing, editing, selling, or posting this item (or any part thereof) on the Internet are all strictly prohibited without first gaining permission from the author. Please contact me if you wish to be granted special permissions!